A Power of Attorney is the foundation of any good disability plan. 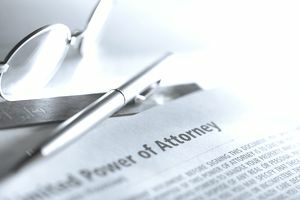 A Power of Attorney is a type of legal document that allows you to delegate your right to manage, invest and spend assets owned in your individual name or in joint names as tenants in common to someone else, called your "Attorney in Fact." What formalities must be observed when the Power of Attorney is signed. Because of these strict state law requirements, it is important to have your estate planning attorney or financial institution assist you with preparing and signing your Power of Attorney. Many states distinguish between a "Springing" Power of Attorney and a "Durable" Power of Attorney." A Springing Power of Attorney is one that only goes into effect if you have been declared, either by a court or by one or more physicians, that you have become mentally incompetent and can no longer properly manage your finances. Thus, the Attorney in Fact that you name in a Springing Power of Attorney will not have any legal authority to manage your finances unless and until you have been determined to be mentally incapacitated. The main disadvantage of relying on a Springing Power of Attorney is that it will delay the payment of your bills and investment of your assets until after the proper documents have been signed that establish your mental incapacity. On the other hand, a Durable Power of Attorney is one that goes into effect as soon as you sign it. Thus, the Attorney in Fact that you name in a Durable Power of Attorney will have immediate authority to manage, invest and spend your assets on your behalf and will not be delayed by your doctors or a judge. It is important to understand how your Power of Attorney will be used to manage your finances if you have a Revocable Living Trust. For assets that have been properly funded into your Revocable Living Trust, your trust agreement will govern the investment and management of the trust assets. Thus, you, as the initial Trustee, or your Disability Trustee if you do become mentally incapacitated, or your Administrative Trustee after you die will have the legal authority to deal with the assets held in the trust. On the other hand, any assets that you have failed to fund into your Revocable Living Trust and you continue to own in your individual name or in joint names as a tenant in common cannot be managed by your Trustee. Thus, your Power of Attorney will be needed for the investment and management of these unfunded assets. What Happens to Your Power of Attorney After You Die? A common misconception is that a Power of Attorney can be used to manage and even transfer ownership of assets after the creator of the Power of Attorney dies. It is simply not the case - after you die, your Power of Attorney will become invalid, and the legal authority of your Attorney in Fact to manage your individual assets will be revoked. If this is the case, then your individual assets, including assets owned as a tenant in common in your individual name, will need to go through the probate process.